MEMPHIS, Tenn. (AP) — A city council in Tennessee plans to consider four different ways to deal with the growing uproar over the existence of two statues of Confederate leaders at city parks. 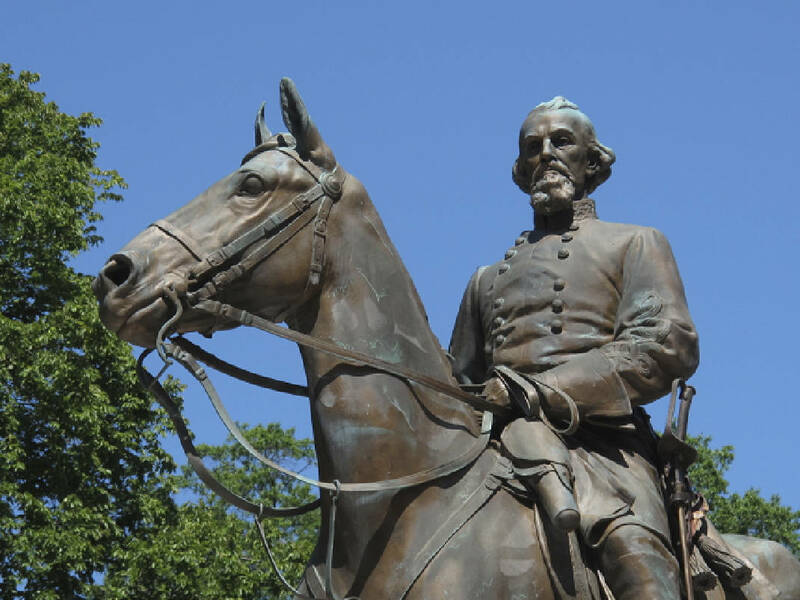 Council members in Memphis agreed Tuesday to discuss a resolution listing steps it can take to remove or board up statues of Jefferson Davis and Nathan Bedford Forrest. Davis was the president of the Confederate States, while Forrest was a slave trader, Confederate general and Ku Klux Klan leader. Both statues have been the target of protests by activists who say the monuments represent racism and hate. Seven people were arrested after clashing with police during a protest at the location of the Forrest statue on Saturday. Criticism of Confederate monuments has been intensifying since a rally earlier this month in Charlottesville, Virginia, turned violent when white nationalists opposed to the city's plan to remove a statue of Gen. Robert E. Lee clashed with counter protesters. Council member Martavius Jones compared having the statues in public parks to erecting monuments to former Japanese Prime Minister Hideki Tojo and others who organized attacks on the United States. "It would be no different than having a monument to Osama bin Laden," said Jones, who is black. Supporters of keeping the statues in place believe they represent an important part of history. The Sons of Confederate Veterans in Memphis has said the statues do not represent white supremacy and it would be a mistake to remove the monuments. The council voted in 2015 to relocate the Forrest statue. But the Tennessee Historical Commission blocked the move under the Heritage Protection Act, which bars removing or disturbing war memorials on public property. A request by the city to waive criteria for the statue's removal was denied in 2016 by the commission. The statue is at a park where the Sons of Confederate Veterans celebrate Forrest's birthday each year, with men and women dressed in Civil War-era garb and waving Confederate flags. The remains of Forrest and his wife are buried under the statue. The city has said it wants to move the remains to a cemetery. Attorney Allan Wade presented the four steps to the council. The first was the immediate removal of the statues by the city, which would violate state law. "I don't think we should go out and yank them down tomorrow without some due process," Wade said. The second option would be to sell the statues to private entities, such as museums, and remove them from the parks. But that move also would violate the law, unless the city gets a waiver from the commission, Wade said. The third step would be to petition the state historical commission for a waiver to its rules. But that is a complicated, lengthy process that has little chance of succeeding, partly because two-thirds of the commission needs to approve the waiver and some members do not want the statues removed. "It is probably easier to have someone executed by lethal injection than to get a waiver from the Tennessee Historical Commission," Wade said. The fourth option would be to board up the monuments in order to guard them from vandalism or destruction and reduce the chance they would attract protests that would threaten the safety of the public and police. Some Memphis city council members agreed that too much money is being spent on guarding the statues and dealing with protests — and police could use those resources on their regular duties. Tami Sawyer, a Memphis activist who is leading the movement to remove the monuments, said she was pleased with the council's decision to consider the four options. A Tennessee Historical Commission spokesman did not immediately return a call placed after working hours on Tuesday. The council plans to discuss the resolution at its next meeting on Sept. 5.